The Meizu 15 and 15 Plus are due in a few days, on April 22 but despite a few leaks and a visit to the TENAA, we still didn't know what chipset they'll use. Didn't know, that is - at least for the Meizu 15 Plus - thanks to an AnTuTu listing. The bigger of the two will use a Samsung-made Exynos 8895, like the one in the Samsung Galaxy S8. The Meizu 15 Plus also packs 6GB of RAM and 64GB of storage. The final details are the Android version - an aging Android 7.0 Nougat - and the screen resolution - a conventional 16:9 2560x1440px. 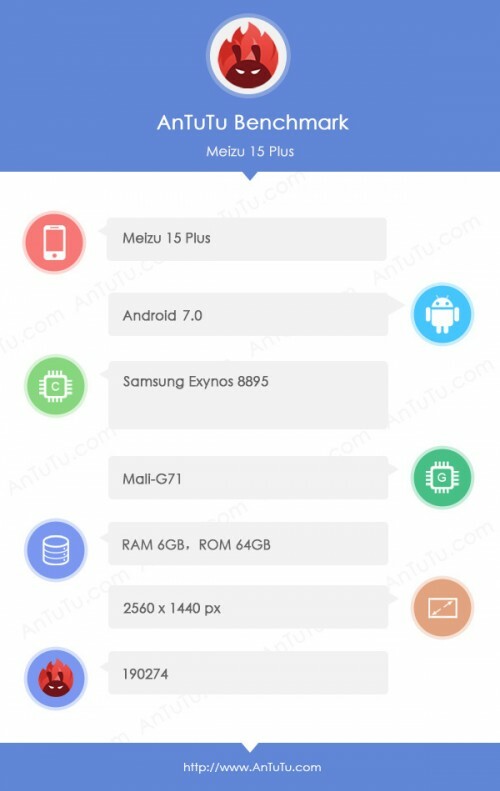 Outside of the AnTuTu listing we've gathered that the Meizu 15 Plus will have a 5.95-inch AMOLED screen, a 3,430mAh battery, a 12MP+20MP dual camera on the back and a 20MP one on the front. As for the smaller Meizu 15, it will have a smaller 5.46-inch AMOLED of FullHD resolution and a smaller 2,940mAh battery. We can only speculate if it will use the same Exynos 8895 chipset as the Meizu 15 Plus. The asker Referred to Xiaomi. Not Meizu. Non that's xiaomi who tried to do that.